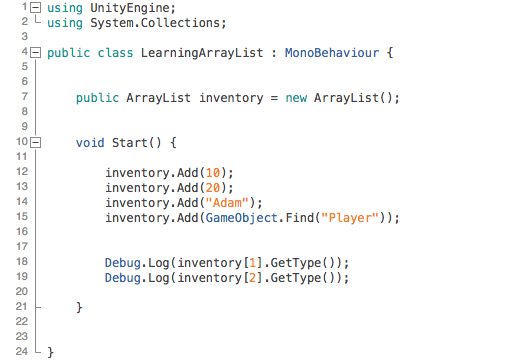 A key ingredient in scripting 3D games with Unity is the ability to work with C# to create arrays, lists, objects and dictionaries within the Unity platform. In this tutorial, we help you to get started with creating arrays, lists, and dictionaries effectively. This article is an excerpt from the book Learning C# by Developing Games with Unity 2017, written by Micael DaGraca, and Greg Lukosek. There’s nothing wrong with this. We can print and assign new values to them. The problem starts when you don’t know how many student names you will be storing. The name variable suggests that it’s a changing element. There is a much cleaner way of storing lists of data. 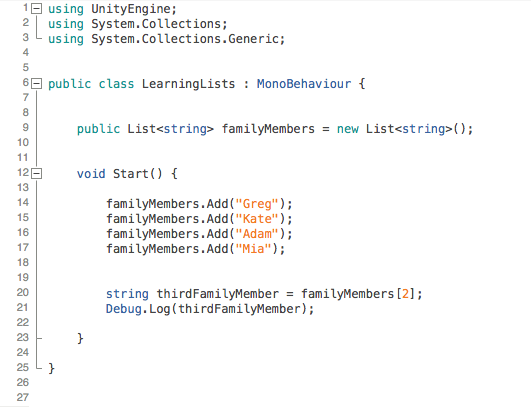 As you can see, all the preceding values are stored in a single variable called familyMembers. 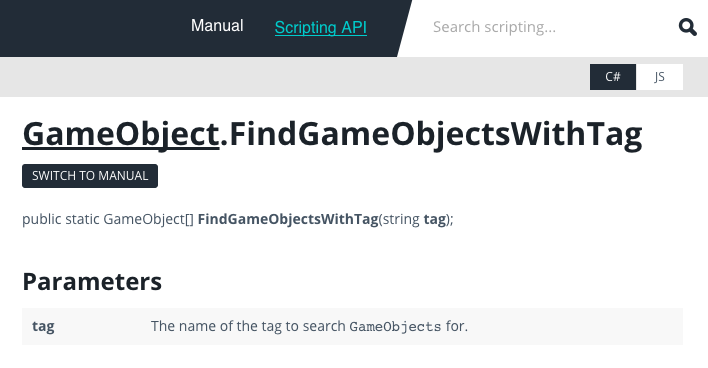 As you can see, GameObject.FindGameObjectsWithTag is a special built-in Unity function that takes a string parameter (tag) and returns an array of GameObjects using this tag. Using a List instead of an array can be so easier to work with in a script. Look at some forum sites related to C# and Unity, and you’ll discover that plenty of programmers simply don’t use an array unless they have to; they prefer to use a List. It is up to the developer’s preference and task. Let’s stick to lists for now. The first thing to understand is that a List has the ability to store any type of object, just like an array. Also, like an array, we must specify which type of object we want a particular List to store. This means that if you want a List of integers of the int type then you can create a List that will store only the int type. As you can see, using Lists is slightly different from using arrays. Line 9 is a declaration and assignment of the familyMembers List. When declaring the list, there is a requirement for a type of objects that you will be storing in the List. Simply write the type between the characters. In this case, we are using string. Lines 14 to 17 are very simple to understand. Each line adds an object at the end of the List, passing the string value in the parentheses. In various documentation, Lists of type look like this: List. Here, T stands for the type of data. This simply means that you can insert any type in place of T and the List will become a list of that specific type. From now on, we will be using it. Add: This adds an object at the end of List. Remove: This removes the first occurrence of a specific object from List. Clear: This removes all elements from List. Contains: This determines whether an element is in List or not. It is very useful to check whether an element is stored in the list. Insert: This inserts an element into List at the specified index. ToArray: This copies the elements of List to a new array. You don’t need to understand all of these at this stage. All I want you to know is that there are many out-of-the-box operations that you can use. If you want to see them all, I encourage you to dive into the C# documentation and search for the List class. Now you are probably thinking, “Okay, which one should I use?” There isn’t a general rule for this. Arrays and List can serve the same purpose. You can find a lot of additional information online to convince you to use one or the other. Arrays are generally faster. For what we are doing at this stage, we don’t need to worry about processing speeds. Some time from now, however, you might need a bit more speed if your game slows down, so this is good to remember. List offers great flexibility. You don’t need to know the size of the list during declaration. There is a massive list of out-of-the-box operations that you can use with List, so it is my recommendation. Array is faster, List is more flexible. Unity will return the data stored in the first place in myArray. It works exactly the same way as the return type methods. So, if myArray stores a string value on index 0, that string will be returned to the place where you are calling it. Complex? It’s not. Let’s show you by example. The index value starts at 0, no 1, so the first element in an array containing 10 elements will be accessible through an index value of 0 and last one through a value of 9. I want to talk about line 20. The rest of it is pretty obvious for you, isn’t it? 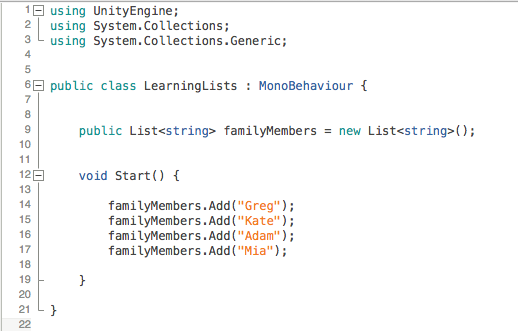 Line 20 creates a new variable called thirdFamilyMember and assigns the third value stored in the familyMembers list. We are using an index value of 2 instead of 3 because in programming counting starts at 0. Try to memorize this; it is a common mistake made by beginners in programming. Go ahead and click Play. You will see the name Adam being printed in the Unity Console. While accessing objects stored in an array, make sure you use an index value between zero and the size of the array. In simpler words, we cannot access data from index 10 in an array that contains only four objects. Makes sense? This is very common; we need to check the size of the array or list. There is a slight difference between a C# array and List. As we need to focus on one of the choices here and move on, from now on we will be using List. We definitely know how to use lists now. We also know how to declare a new list and add, remove, and retrieve elements. Moreover, you have learned that the data stored in List must be of the same type across all elements. Let’s throw a little curveball. ArrayList is basically List without a specified type of data. This means that we can store whatever objects we want. Storing elements of different types is also possible. ArrayList is very flexible. You have probably noticed that ArrayList also supports all common operations, such as .Add(). Lines 12 to 15 add different elements into the array. The first two are of the integer type, the third is a string type, and the last one is a GameObject. All mixed types of elements in one variable! When using ArrayList, you might need to check what type of element is under a specific index to know how to treat it in code. Unity provides a very useful function that you can use on virtually any type of object. Its GetType() method returns the type of the object, not the value. We are using it in lines 18 and 19 to print the types of the second and third elements. When we talk about collection data, we need to mention Dictionaries. A Dictionary is similar to a List. However, instead of accessing a certain element by index value, we use a string called key. The Dictionary that you will probably be using the most often is called Hashtable. Feel free to dive into the C# documentation after reading this chapter to discover all the bits of this powerful class. We already know that using Debug.Log serves to display a message on the Unity console, so what are we trying to display? A string value (it’s one that can contain letters and numbers), then we specify where that value is stored. In this case, the information is stored under Hashtable personalDetails and the content that we want to display is firstName. Similar to ArrayList, we can store mixed-type data in Hashtable. Unity requires the developer to specify how an accessed element should be treated. To do this, we need to cast the element into a specific data type. The syntax is very simple. There are brackets with the data type inside, followed by the Hashtable variable name. Then, in square brackets, we have to enter the key string the value is stored under. Ufff, confusing! I hope that this is clear now. If it isn’t, why not search for more examples on the Unity forums? How do I know what’s inside my Hashtable? Hashtable, by default, isn’t displayed in the Unity Inspector panel. You cannot simply look at the Inspector tab and preview all keys and values in your public member Hashtable. We can do this in code, however. You know how to access a value and cast it. What if you are trying to access the value under a key that isn’t stored in the Hashtable? Unity will spit out a null reference error and your program is likely to crash. This determines whether the array contains the item and if so, the code will continue; otherwise, it will stop there, preventing any error. We discussed how to use C# to create arrays, lists, dictionaries and objects in Unity. The code samples and the examples will help you implement these from the platform. Do check out this book Learning C# by Developing Games with Unity 2017 to develop your first interactive 2D and 3D platform game. “You are trying to create a MonoBehaviour using the ‘new’ keyword. This is not allowed. MonoBehaviours can only be added using AddComponent(). Alternatively, your script can inherit from ScriptableObject or no base class at all”. This is a problem I’m facing now and still don’t know how to solve it. 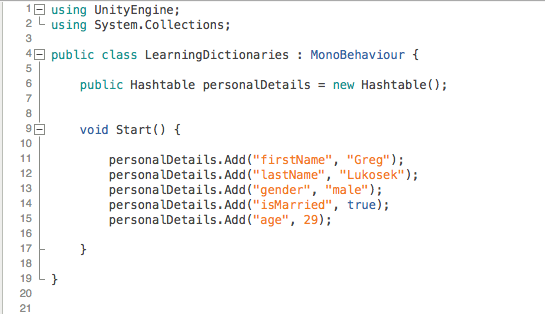 What would be the best aproach, create a non Monobehavior class and store the array there or use AddComponent()?